Do you love chili? How about a great deal? Well, TEXAZ Grill in Phoenix is offering both along with a little taste of Texas. 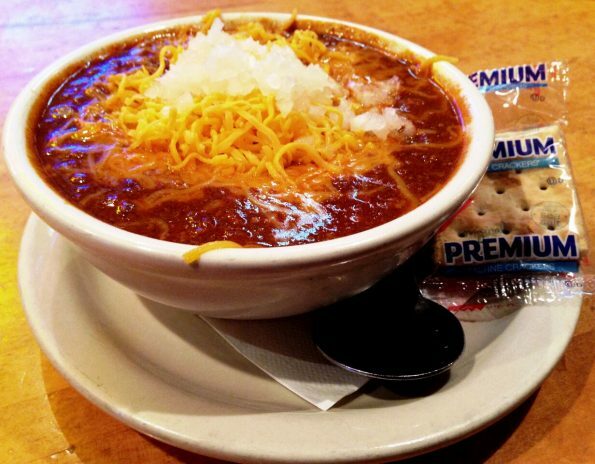 Chili enthusiasts, carne lovers and anyone looking for a bowl of chili that’s as big as Texas head on over for this delicious deal! Celebrating 30 years serving an official judge at International Championship Chili Cookoff, it’s fair to say no one in the Valley takes their chili as seriously as Steve Freidkin, the owner/chef at TEXAZ Grill. Not only has he been simmering up his own authentic, from-scratch TEXAZ Red Chili since 1985, but this November 5th, he will serve as an official judge at the world-famous annual chili cookoff “Behind the Store” in Terlingua, Texas, which is celebrating its Golden Anniversary as the world’s top chili cookoff in 2016. So in anticipation of this internationally acclaimed event, TEXAZ Grill is offering all-you-can-eat TEXAZ Red Chili for just $7.50 Saturday, November 5 from 11 am – 4pm (no sharing, to-go or doggie bags). Also on November 5, TEXAZ Grill will be serving up $3 Shiner Bock beers and $6 Republic tequila shots from 11 am – 4 pm. It’s as close as you can come to chili nirvana without actually road-tripping 14 hours to west Texas to attend this famed cookoff. For 31 years Steve Freidkin, owner, chief cook and bottle washer at TEXAZ Grill, has been cooking up Chicken Fried Steak after Chicken Fried Steak, with more than 895,820 steaks having been served to date… and counting. TEXAZ Grill’s unique setting is a tribute to the things that Texas devotees love about the Lone Star State. The award-winning restaurant has been recognized locally as the Best Local Treasure, Best American Restaurant, and Best Affordable Steak Dinner, and nationally for Tops for Value.